The 100 model cello from the KG workshop is similar to the 80 model, but has a more tradition hand applied oil varnish and nicer timber. The instrument is set up by Simmers Violins and includes a high quality French Despiau bridge blank and Larsen strings. The KG100 is supplied with a bow and soft case. Simmers Violin Makers – Studio Series cello. Studio Series cellos, come in different levels and prices, depending on the amount of work completed in our Red Hill workshop. The latest in our line of Studio Series cellos has just been completed and is now available. 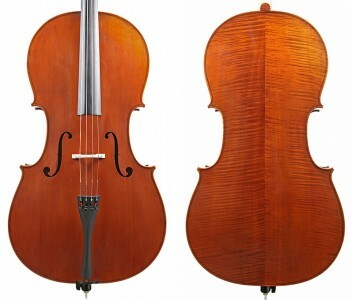 This cello is modelled after a well known by Giuseppe filius Andrea Guarneri. 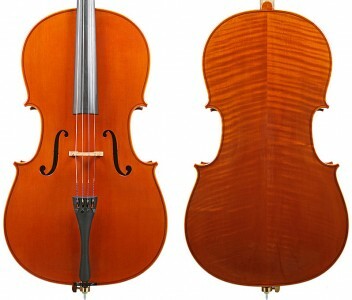 By outsourcing the initial stages of making the cello, we can offer a very high quality instrument at half the cost of a cello fully mady by John Simmers. Jay Haide instruments are made for Ifshin violin in Berkley California and supplied to good violin shops the world over. We are pleased to offer these instruments with our own high quality setup including quality European fittings and Larsen strings. The 200 model cello from KG is our most popular cello for students moving up to their first full size instrument. Personally prepared by John Simmers with a detailed setup including reshaping the fingerboard, a fine French bridge and a full set of Larsen strings. 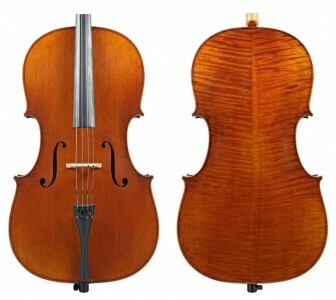 The 80 model cello from the KG workshop is our preferred student level cello. They are made to a very high standard and are chosen for their amazing quality for this price level. We believe this is the minimum quality that students of all levels deserve. The quality of this instrument allows us to perform a detailed setup which is included in the price. The setup includes the highest quality Despiau bridge blank and Larsen strings. Also included is a bow and soft case. KG80 cellos are available in 4/4, ¾ and ½ sizes.